This modern timber home is so stylish that it's hard to believe it's a prefabricated unit. For those who aren't aware, prefabricated units are constructed in a factory and assembled on the site. It's a hugely cost effective type of housing that was once dismissed for its factory style designs. But with the growing emphasis on environmentally friendly design, the prefabricated market has been making great strides. As seen here, a prefabricated home can be just as stylish as any other home. As a bonus, you get all the added benefits and price is just one of them. 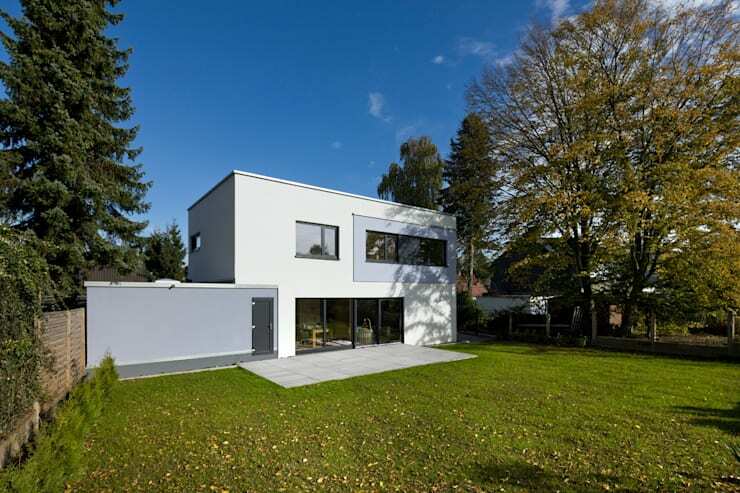 Pushmann architects are quite rightly proud of this home. Each unit, which they have dubbed Holzrahmenbau is modified and individually designed for each family. Construction takes around five months and although the planning stages are a little long, this is more than compensated for by the short installation period. Think two days for the basic construction to be up and two weeks to make it weather proof with windows and roof. It's known as a low energy home, made from renewable raw wood and it has superb insulation qualities. But it's really the stylishness of the home that has us enthralled. Come with us to explore more. Prefabricated homes or modular units as they are often called, really work best with block-like masses. They are easy to construct, stable and easy to quickly install. Here we can see how the various masses of cube like shapes have been shifted and moved around to create a contemporary facade. The facade has a solid, family style presence, but at the same time the white upper mass leads the eye around to create visual interest. From this side view of the facade, we get a closer look at the impressive entrance. The white upper mass over the darker, mute blue garage area has a bright, light quality. We can also see how the shift in forms has created a little shade and wind break at the entrance. The landscaping has yet to be installed, but it's easy to see how naturally the building will work with the surrounding landscape. The bright, clean and uplifting energy of Scandinavian interiors have been all the rage for a while now. Here we have a good sense of how golden timber has been used on the floors, staircase and bannister to add that warm, natural feel to the home. Lots of white and large windows add a lot of bright sunlight to the interior. There's nothing drab about this factory made interior. At the bottom of the stairs we have a good look at the completely contemporary interior style. 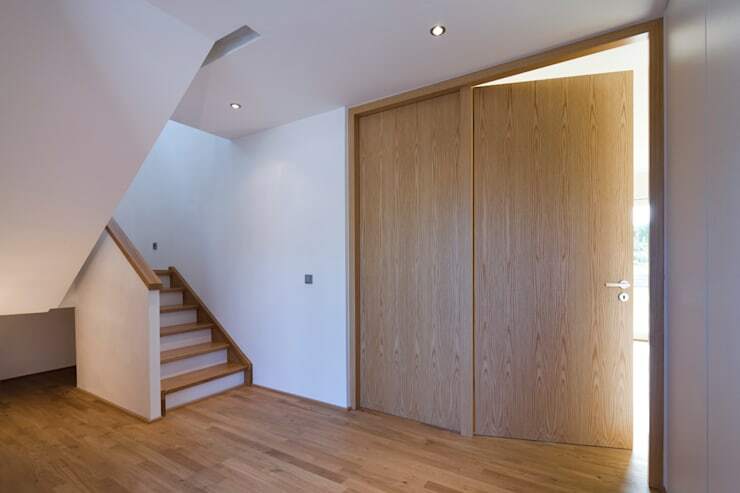 There's no point thinking small, so the architects have designed floor to ceiling timber doors that add a very organic panache to the home. You don't need a lot of detailing and fuss when you have such beautiful materials in a home. 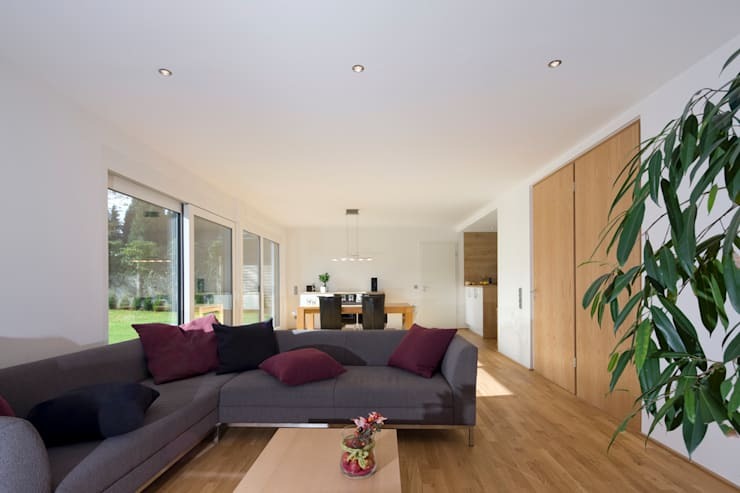 Contemporary living is all about simple, open plan layouts. Prefabricated housing is very well suited to this kind of layout. Perhaps this is one of the reasons it has done so well in recent years. In this open plan living area we get a good look at the bright, natural decor. Vast expanses of natural timber and lots of white have been used in alternative surfaces to create interest. 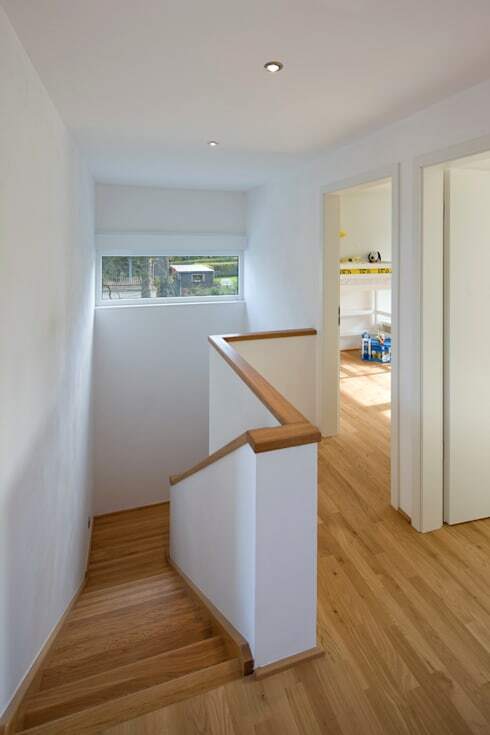 Also note how this home has been designed to soak up all the natural light. 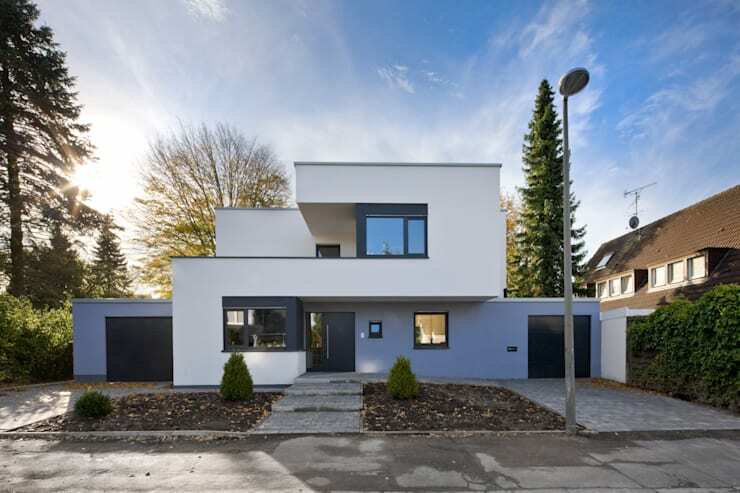 This particular home is situated in Germany and the module was obviously amended to make the most of the sun's heat generating energy. Finally we come to the rear of the property. Here we can see how the masses of the front have been resolved into one, flat wall. A series of floor to ceiling glass windows and doors have been installed to make the most of nature. Note how the building has been designed with a stylish, but contained layout. This is one of the prime reasons this home is so energy efficient. It doesn't take much energy to heat and easily cools down in summer. If you are interested in modular housing, you'll love this Ideabook A Stylish Modular home in Italy. What do you think of this prefabricated home? We would love to hear in the comments below.